The University of Minnesota’s education program in the College of Education and Human Development ranks #3 in the world, according to the Academic Ranking of World Universities (ARWU) 2017 report. Only prestigious private universities Harvard and Stanford are ranked higher, making CEHD the highest rated public education program in the world. During the 2016-2017 academic year, 256 students had international experiences in 47 different countries. 200 students were undergraduates. 56 were graduate students whose work included research, coursework, and international development projects. 270 of our students are international students. The new JRM Fellows program provides internships for CEHD graduate students abroad through generous funding from the JRM Foundation. This is a great opportunity to start or explore research interests in the Global South, international education, and other broad issues that intersect with education. Fellows will receive airfare and living expenses. Potentially, JRM Fellows could co-teach at the school in a content area of interest. All CEHD graduate and professional students are eligible for this program. Submit cover letter, CV, and names and contact information of two references (all in one pdf document) to aleix001@umn.edu by March 1, 2019. The Mary Tjovold ("Mary T.") Scholars program is one of the few study abroad programs at the University of Minnesota that provides graduate students an opportunity to engage in graduate-level professional development through community-based work in a foreign country. With airfare and most living expenses included in the program, this is not only a unique opportunity to build cultural awareness, but one of the most affordable opportunities for graduate student participation. All CEHD graduate students are eligible to apply for this program. Learn more about the program, and the 2019 work in Chiang Khong, Thailand. We partner with institutions from across the globe in exchanges, teaching, and research. See some of our program partnerships. If you're interested in a partnership between your institution and CEHD, contact Marina Alexio at aleix001@umn.edu. Our Global Teacher Education Program (GTEP) is a professional development program for educators. This intensive program provides participants the opportunity to learn about innovative teaching strategies and assessments used in U.S. schools, develop further their English language proficiency, and engage in experiential learning through classroom observations and school internships. Scholars from around the world join our college community each year to further our research and teaching. Read profiles of our 2017 scholars. Each of our departments has its own policies and procedures for working with international scholars. If you're interested in being a visiting scholar, please contact the department directly. 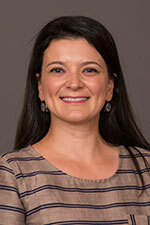 Marina B. Aleixo is Program Director of International Initiatives and Relations at the College of Education and Human Development (CEHD) at the University of Minnesota. Her work involves developing and negotiating global partnerships on behalf of CEHD with institutions from around the world. As program director, her focus is on developing new opportunities for international collaboration, research, and worldwide partnerships, particularly in the area of teacher and faculty education and training. Dr. Aleixo also leads the Global Teacher Education Program (GTEP) initiative, a short-term professional development program designed for international educators. Dr. Aleixo’s research and scholarship explores the experiences of immigrant students and families. Currently she is involved in two international research projects. Multi-national Exploration of the School Experience of Somali Immigrant and Refugee Students examines the experience of Somali youth in Sweden, Netherlands, and England. The study explores how immigration policies in each country impact these school experiences. Supporting Refugees through Family Separation: Ambiguous Loss for Cambodian American Minnesotans documents the experience of recently deported Cambodian refugees in Cambodia, and their families left behind in Minnesota. Domestically, Dr. Aleixo has been involved in a collaborative multi-institutional research study that documents the college experiences of immigrant students. Dr. Aleixo teaches courses that explore immigration policy and its impact on student school and community experiences. Her course, Borderland, Education Policy, and the Immigrant Student Experience examines the historical marginalization of immigrant and underrepresented students and families in the US educational system. This spring semester course also includes a one-week experience over spring break to Tucson, Arizona where students work with organizations that support migrants during the border crossing process. Dr. Aleixo also teaches Taste of South Korea: Culture, Language, and Education, a comparative international education course that evaluates and compares current US and Korean educational systems. The course also explores the historical background of Korean education, and its impact on current social, political and educational policies. Stebleton, M. & Aleixo, M. (2016). Black African Immigrant College Students' Perceptions of Belonging at a Predominately White Institution (PWI). Journal of The First-Year Experience & Students in Transition. Stebleton, M. & Aleixo, M. (2015). Examining undocumented Latino/a student interactions with faculty and institutional agents. Journal of Hispanic Higher Education, 1-18. Aleixo, M., Hansen, S., Horii, S. & Un, S. (2014). Theory ain’t practice: Four novice researchers navigate dilemmas of representation within immigrant populations. Diaspora, Indigenous and Minority Education, 8, 32-43.